Over the years, I have had a few customers tell me that their good bull went bad. They purchased bulls with 5-star dispositions — but those bulls eventually reached the point that they would offer to chase their owner out of the corral. How did that happen? What would cause a good bull to go so bad? Truth be known, I have had more reports of 5-star disposition bulls going bad than 3-star disposition bulls. I experienced this first-hand with PCC Pledge, who is one of the most popular herd sires in the PCC program. I’ve been told that when Pledge was a calf he enjoyed close interaction with people. He was so gentle that he was often in the way. On the surface, there is nothing wrong with this type of behavior. When we later evaluated Pledge, we gave him a 5-star disposition. He was a very gentle and easy-going bull. When crowded from both sides in a sorting ally, he allowed us to walk up and touch him. He had absolutely no fear of people. That, my friend, is the reason good bulls sometimes go bad. The normal predator/prey relationship does not exist. 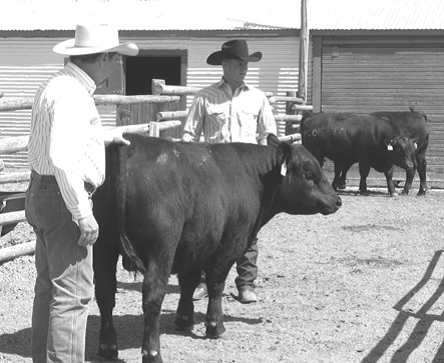 Kit & Tyson Pharo - evaluating a young bull that may be too gentle. Most bulls, like most teenage boys, will eventually see what they can get away with. They might shake their head at you or paw the ground. They might go as far as to take a few steps toward you. They are feeling a little frisky and they want to see how you will react. Basically, they are challenging you for top spot in the herd. Your response will keep your good bull good or cause him to go bad. If your bull senses that he has successfully bluffed you, he will continue to challenge you. It’s possible for him to go from good to bad to worse. Before your bull gets your bluff, I suggest you get a four or five foot sorting stick and walk straight toward the bull’s head. If he does not turn and walk away before you get close enough to touch him with the stick, you should tap him gently on the nose until he has been persuaded to turn and walk away from you. You do not want your bull to run over the hill every time he sees you — but neither do you want him to allow you to get close enough to touch him with a sorting stick. Your bull needs to maintain a healthy level of respect for you. He needs to see you as the boss. Do NOT, under any circumstances, make a pet out of your bull! Most dairy bulls were raised on a bottle by humans. As you may or may not know, dairy bulls are notorious for being very mean. As youngsters, they had no reason to be afraid of people. Therefore, they never did develop the proper respect for people. It must be extremely confusing for a bovine critter to grow up with human parents. I’m sure it would take many, many years of Psychiatric treatment to even begin to sort out all of the mixed-up feelings. Back to my encounter with Pledge... When Pledge decided to challenge my authority, I was caught completely off guard — and surrounded by several witnesses. He put me on the fence in a hurry. He has tried to do the same thing at least twice since then. To my knowledge, though, Pledge has never tried to challenge anyone else. Some think I am delusional when I tell them that Pledge put me on the fence. As I said before, once a bull has bluffed you, he will continue to challenge you. If you fail to gain back his respect, your good bull will go bad.